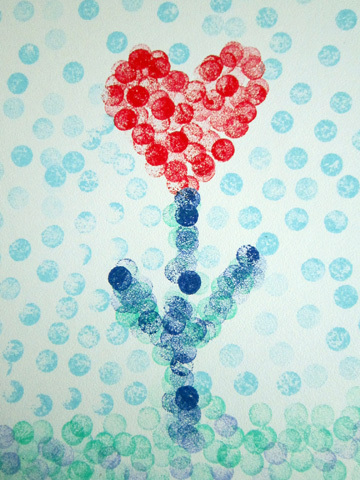 Pointillism is a way of creating an image by building up dots of color. George Seurat is perhaps the most famous of painters to use this technique. Rather than use oil paint, I like to teach the concept with rubber stamp pads in assorted colors and some brand new pencils. The eraser tips make beautiful dots and little fingers stay clean! 1. Sketch out your idea. With a sharpened pencil, sketch out your idea. Do you want to make a picture of your house or your garden? You decide. Draw lightly. You don’t want your pencil marks to be obvious in your finished illustration. 2. Fill in you first layer of colors. Press your eraser into the stamp pad and make a mark on your paper. To achieve a clear, perfect dot press firmly while holding the pencil perpendicular to the paper. If you hold the pencil at an angle you are likely to make a half moon shape. You will notice that you will need to reink your eraser often if you want darker dots. If you want lighter dots, keep stamping until the ink runs out before reinking your eraser. 3. Add your second and third layers of color. Your image may be too faint, so you need to add another layer. Experiment. What happens when you add dark blue dots on top of green dots? Keep adding dots and switching colors until you achieve an image you like. Remember to not mix your colors! 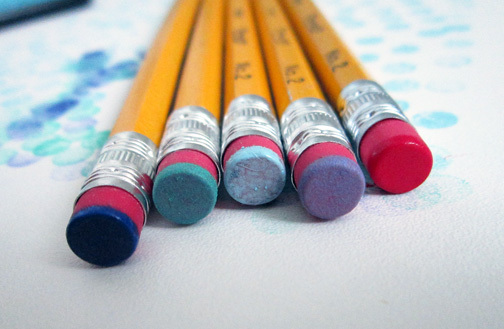 Use a separate pencil eraser for each color. Allow your image to dry.